Enter for your chance to Win $150 to spend at ShopBack. 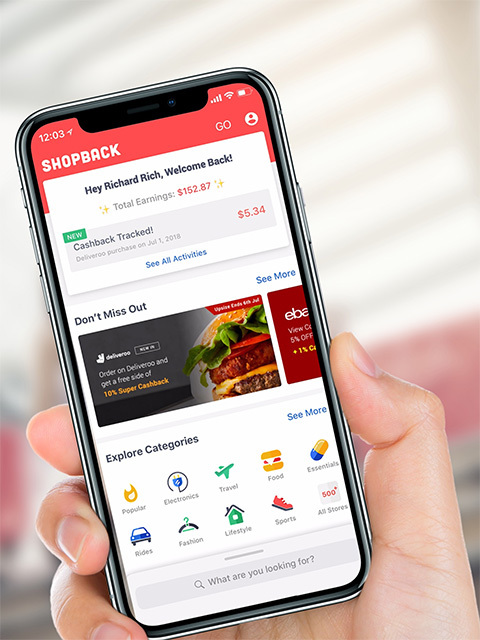 Asia-Pacific's leading cashback portal, ShopBack, has helped over seven million users globally save millions of dollars on their online shopping, with just one click or tap of a button. Since launching in Australia this May, the one-stop lifestyle platform has already enabled consumers across the country to earn hundreds of dollars every month in rewards, simply by shopping for their favourite everyday brands via the website or app. Powering Aussies to make smarter purchase decisions, ShopBack saves consumers time and money by offering the best deals and discounts via a raft of leading click-and-mortar retail partners. The lifestyle platform is now providing up to 49% cashback this Christmas, with the launch of its inaugural online shopping festival, ShopFest. Cashback earned can then be withdrawn as real money via bank transfer or Paypal. In an Australian first, ShopFest brings together over 800 iconic Australian retailers across fashion, health and beauty, tech, travel, food and home, for the smarter way to year-end shopping. The initiative is designed to help shoppers navigate the maze of sales during the festive season with access to exclusive deals and prizes. Leading brands on-board include eBay, David Jones, Myer, THE ICONIC, Booking,com, Woolworths, Deliveroo and Chemist Warehouse. ● Melbourne Cup: (1 – 6 November) Aussies can race their way to exclusive flash deals with up to triple rewards on over 50 fashion and beauty brands including Myer, Adore Beauty and The Iconic. ● Singles' Day: (11 – 12 November) Celebrate the single biggest event of the year with deals from the largest marketplaces and electronics retailers such as ebay, Blackmores, Jurlique, Aliexpress and Taobao/Tmall. Who better to treat yourself than yourself! ● Click Frenzy: (13 – 14 November) Join the frenzy as ShopBack partners offer supersized cashback and promotions on iconic clothing and homeware brands such as Dell. ● Black Friday and Cyber Monday: (23 – 26 November) The one-stop destination for the best bargains and up to 49% thumb-stopping cashback deals from both global and local brands. ● 12 Days of Christmas: (1 – 12 December) ShopBack Santa is on a gifting frenzy with an advent calendar of epic rewards, from Australia's favourite stores such as Chemist Warehouse and Groupon. In addition to stellar sales and huge cash earning opportunities, Aussies can also win over $100K worth of prizes in the ShopFest Ultimate Experience and Treasure Chest, including a tropical holiday to the enchanting Indonesian town of Labuan Bajo, as well as prizes such as Dyson vacuum cleaners, Kmart gift cards and exclusive gift vouchers. ShopBack Australia Country Manager, Angus Muffet, says ShopFest should be the first and last stop for Aussies this festive season. "With over seven million customers globally and a successful launch into the Australian market earlier this year, ShopBack is paving the way for smarter online shopping. We are thrilled to unveil the first ever ShopFest festival. Covering the biggest year-end sales ShopFest efficiently connects both retailers and shoppers, to help Aussies save on their Christmas purchases and earn cashback through online shopping." Booking.com Regional Director of Strategic Partnerships, APAC, Stewart Jones, says Booking.com is delighted to partner with ShopBack for ShopFest's Ultimate Experience grand prize. accommodation to stay anywhere in the world is the reason Booking.com exists." To access ShopFest cashback rewards, shoppers simply need to sign up for a free account, then either download the award-winning mobile app or start shopping via the website, and earn cashback that can be withdrawn as real money via bank transfer or Paypal. Founded in Singapore in 2014, ShopBack is the brainchild of entrepreneurs Henry Chan and Joel Leong - who also brought on board Josephine Chow and Lai Shanru - recently named within the 2018 'Forbes 30 under 30 Asia List' for retail and ecommerce. Since launch in Singapore, the startup has expanded into seven countries worldwide, to cement itself as the leading platform for cashback in Asia Pacific. For more information about the site offering Australia's biggest and best deals daily, visit the ShopFest website: www.shopback.com.au/shopfest or download the mobile app from the App Store or Google Play.